The outer ring has a mounting and splines, which to the one-way clutch. This attords greater compatress of FF-type automatic transmission. Reduced weight and costs have been achieved by using PA46 plastic cage with superior off and heat resistance. Manual Transmission must adequately meet driver expectations of control by conveying a smooth, precise, and crisp feeling. Transmissions must also be compact, lightweight, and be able to seliver excellent fule efficiency for the increased number of gears that are appearing in newer vechicles. the bearings and synchronized parts created by NSK play a key role in supporting the future of manual transmission with their unsurpassed reliability and capability developed with tribology technology. Long Life has been achieved by specially designed seals for transmissions. 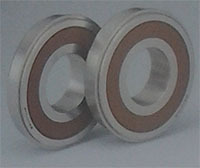 The seals prevent ingress of contaminants in the oil. 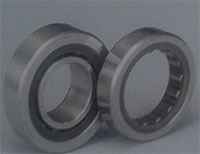 Size redustions from standard open type bearings can be achived. High capacity cylindrical roller bearings for radial load. as well as axial load from gear meshing. Superior roller stability after assembling the cup and the cone achieves quick and high precision preload setting. The set preload is maintained at higher levels for longer periods.